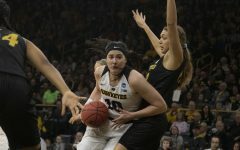 Iowa didn’t perform like it wanted against Indiana, leaving numerous spots to improve against Bradley. 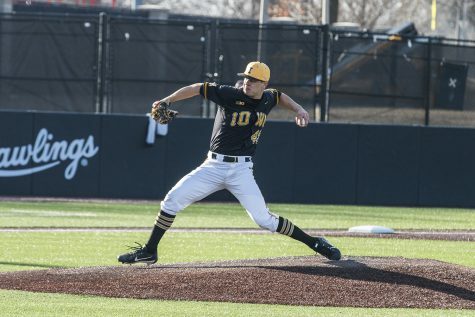 Iowa pitcher Cam Baumann throws a pitch during the first game of a baseball doubleheader between Iowa and Cal-State Northridge at Duane Banks Field on Sunday, March 17, 2019. 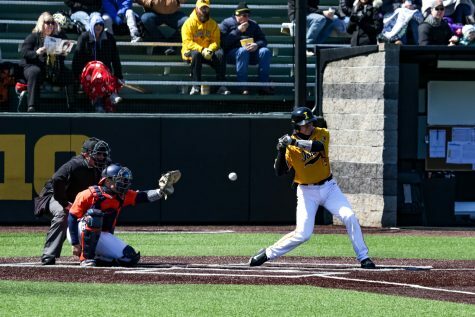 The Hawkeyes defeated the Matadors, 5-4. 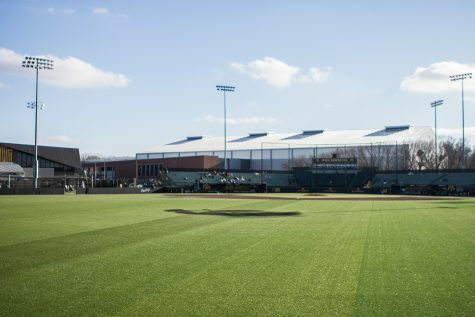 Iowa baseball started its Big Ten season off with a slide, getting swept by Indiana in a three-game weekend series in Bloomington on March 22-24. 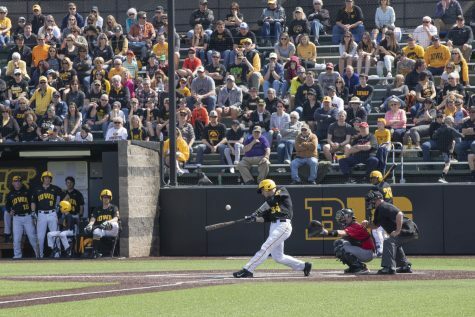 The series against the Hoosiers left much to be desired from Iowa, which is why it must improve before it takes on Bradley at Banks Field today at 4:05 p.m. 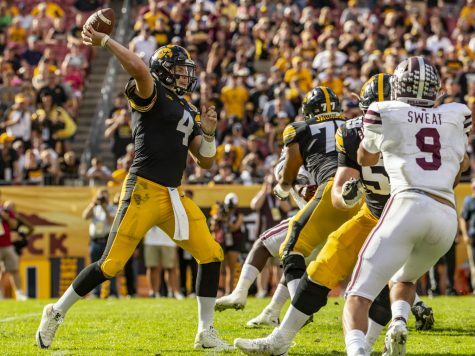 The Hawkeyes certainly have capable producers in the lineup, but they couldn’t capitalize in Bloomington. 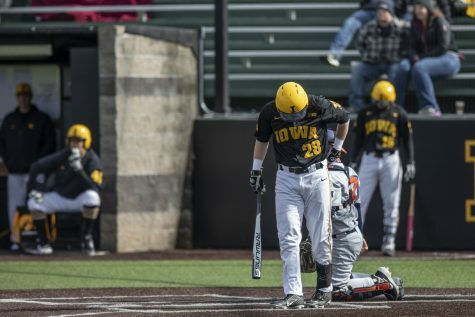 Iowa scored just 1 run each in two games and was outscored 20-2 in the pair. 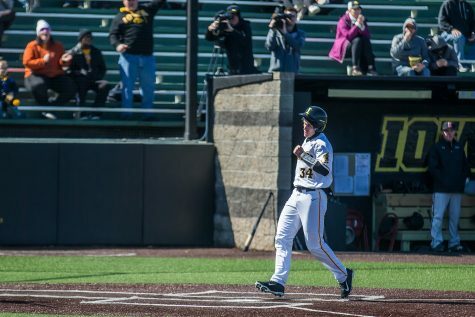 In the first game of the series, the Hawkeyes only managed to plate 2 runs but kept it close, falling, 3-2. Iowa racked up hits in Game 1 and Game 3 with 7 and 9, respectively, but it couldn’t capitalize on the scoreboard. 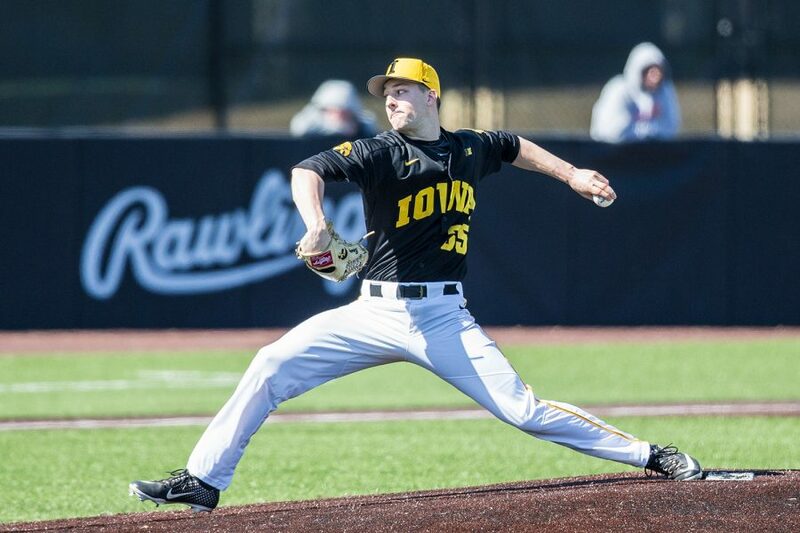 While most of Iowa’s starters weren’t terrible — Cole McDonald and Grant Judkins each gave up 2 earned runs — things fell off in the bullpen. 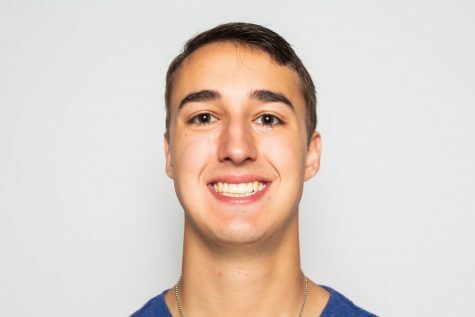 In Game 1, Grant Leonard gave up the game-winning run to the Hoosiers in the bottom of the ninth, which ended up being a sign of things to come. After Baumann had a rough start in Game 2, giving up 4 runs in 2.1 innings, the bullpen couldn’t buck the trend. Kyle Shimp conceded 2 runs in an inning of work, Jason Foster gave up 4 in 0.2 innings, and Drew Irvine allowed 3 in two innings. Judkins pitched six innings in the third game and allowed 2 earned runs and 2 unearned. He was followed by Trace Hoffman, who gave up 3 in the next inning. 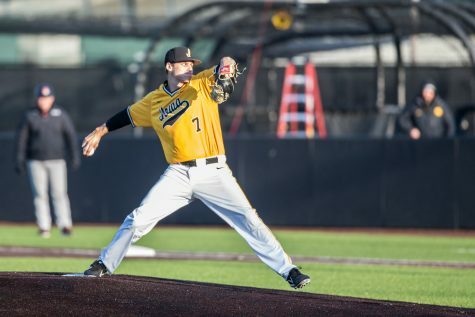 Iowa pitcher Kyle Shimp prepares to throw the ball during men’s baseball Iowa vs. Loras at Duane Banks Field on March 21, 2018. 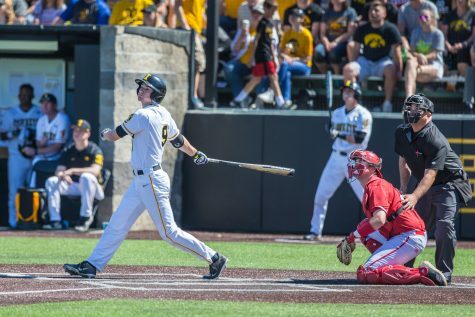 The Hawkeyes defeated the Duhawks 6-4. With Jack Dreyer out with injury, Baumann has stepped up in his typical Saturday-starter position on the mound. 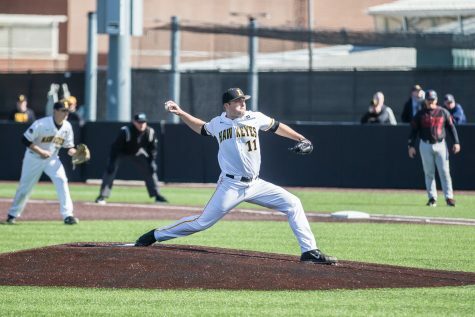 Against Indiana, the sophomore lasted just 2.1 innings in an all-around disastrous day defensively for the Black and Gold. After a scoreless first, Baumann gave up a pair of runs in the second. Then, in the third inning, the lefty gave up 2 more, and head coach Rick Heller took him out. In the 13-1 loss, Baumann faced 15 batters, striking out 3 and walking 4. This season, Baumann is 0-2 with a 6.23 ERA. 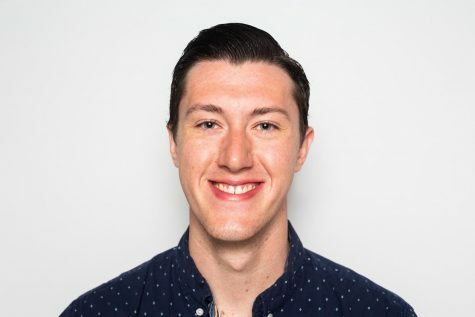 He’s given up 17 runs in his 21.2 innings on the mound — just 2 fewer than Friday starter Cole McDonald, who’s pitched 10 innings more. 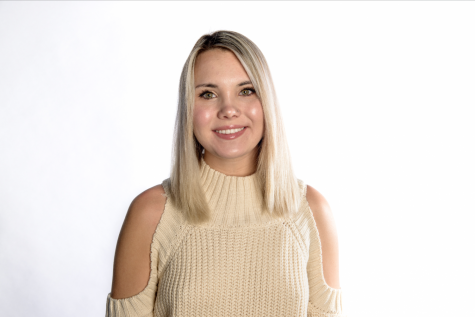 As a whole, Iowa notched 21 hits in its three games against Indiana. 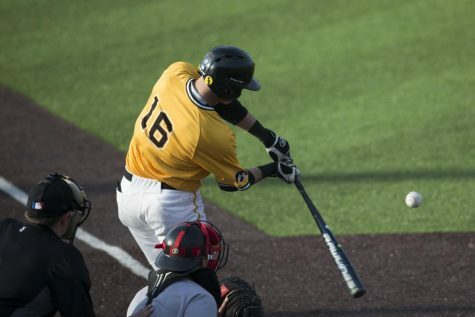 Justin Jenkins, Trenton Wallace, and Austin Martin were the only Hawkeyes to notch at least 2 hits in a single game. Martin was the first, going 2-for-3 in the series opener. He recorded an RBI as well. Wallace’s 2 hits came in the second loss. He finished 2-for-4. Jenkins rounded out the trio, going 2-for-3 on Sunday.